SAXON - The Meyer Farm's Belgian Horses once again entertained audiences at the Iron County Fair. 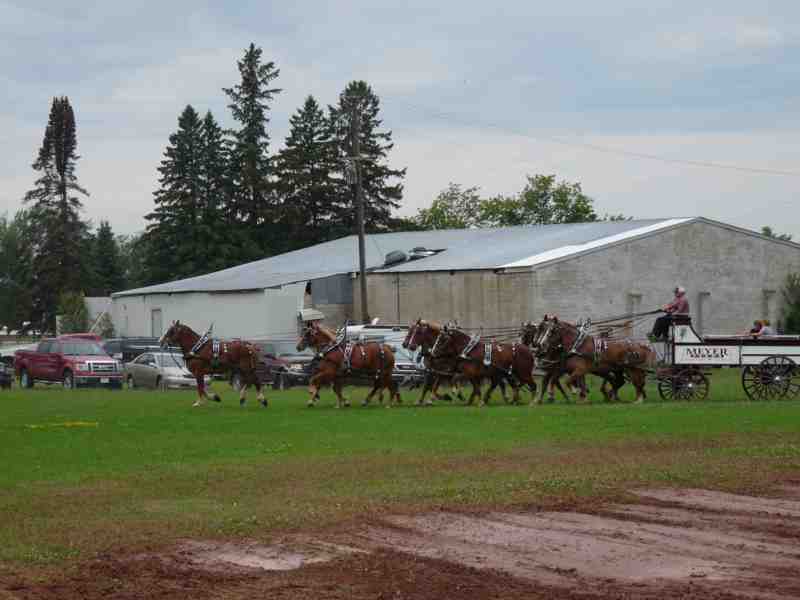 The Meyer's show is a perennial crowd pleaser at the Saxon Fairgrounds. The pyramid hitch is unique in that no horse is right in front of another. The horses are set up like "bowling pins". Four horses are on the wheel (back closest to the wagon), three line up for the swing, two in the point, and one out in front. Putting all this together requires a lot of time and manpower, and that is why the whole Meyer family is involved with showing the Belgian horses. Everyone pitches in to put on an exhibition for spec­tators to enjoy. Randy Meyer is the primary driver. Son Kurt has also taken the lines a time or two. The Meyer's and their horses are from the Loyal, Wisconsin area. Pictured above - Randy brings lead horse "Mike" over for photo op with IronwoodInfo photographer.